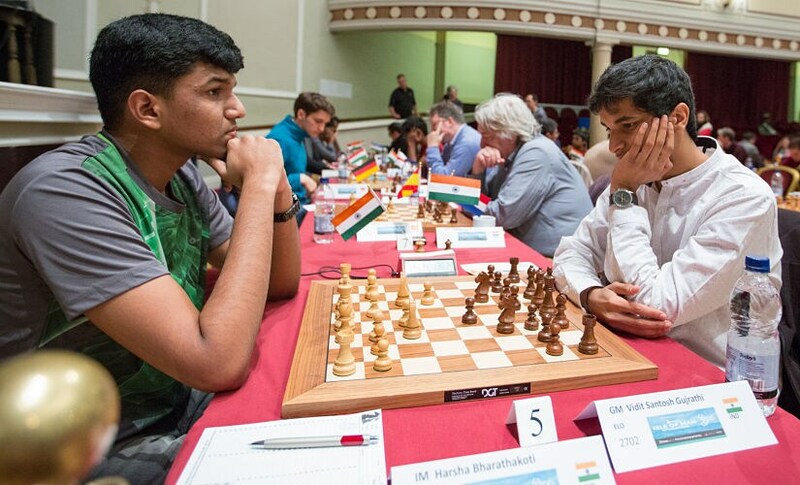 Four Indians were paired against their compatriots in the sixth round of the Isle of Man Chess Open. 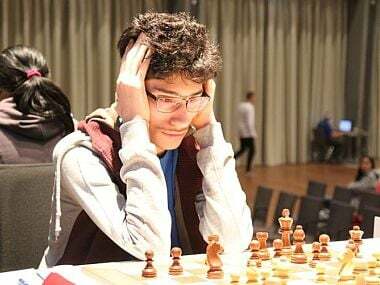 On board five, Harsha Bharathkoti, a 17-year-old kid who had done wondrously well at this event so far, was pitted against the Indian number three, Vidit Gujrathi. Right next to them, on board six, were Viswanathan Anand and SP Sethuraman. There were only three decisive games in the top ten boards of the tournament and these were two of those. With the white pieces in hand, Bharathkoti essayed the Four Knights Variation of the English Opening. But little did he know what he had got himself into. On as early as move seven, Gujrathi uncorked a novelty and shattered the 17-year-old’s pawn structure. As play progressed, the unsettled Bharathakoti overlooked a neat combination by Gujrathi on the 18th move and allowed his opponent to win a pawn and exchange queens. As a result, the players reached a double rook endgame in which the higher rated Indian not only had an extra pawn but also enjoyed fantastic piece activity. Playing with almost computer-like precision, Gujrathi was able to tie down both Bharathkoti’s king and his rook to the defence of his pawns. Unable to find any play for his pieces, the Andhra youngster chose to throw in the towel on move 42, despite only being a pawn down. In the other India versus India clash on board six, Anand had the white pieces against Sethuraman. In response to Anand’s king pawn opening, Sethuraman went for the riskier variation of the Spanish Opening, the open variation. 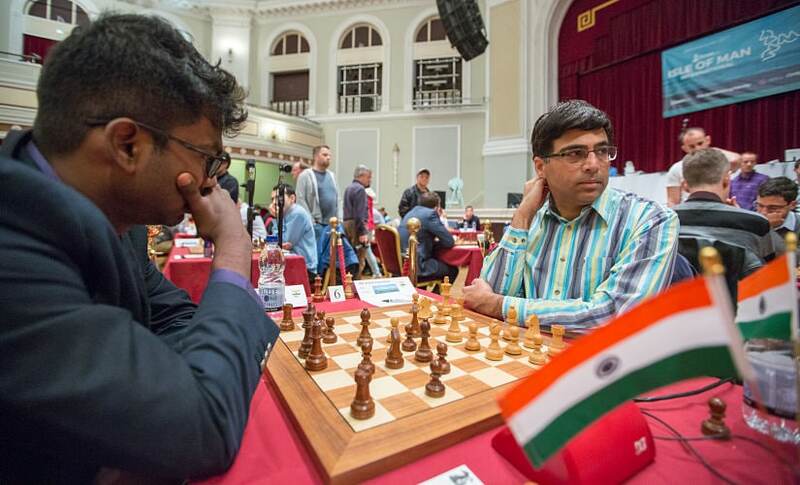 The opening per se was a success for Sethuraman as he was able to get to a decent position out of the opening. But around move 25, he seemed to be losing the thread and lost a pawn. Once he had the better position, Anand dived in with his queen into the black camp in an attempt to create checkmating threats. He even offered a knight sacrifice which, if taken, would have led to instant checkmate. Sethuraman therefore decided not to take the pawn and sought play in the center instead. In response, Anand began rolling his passed pawn in the center and ended up collecting a piece. As compensation, Sethuraman had two connected passed pawns on the queen side, but this turned out to be insufficient. Anand activated his rooks quickly and posted them on right under the nose of the black king, and in a few moves, the knight also joined the attack. Being a piece down and with mating threats all around, Sethuraman decided it was time to resign. The third game to finish decisively was the top board encounter between tournament leaders Magnus Carlsen and Pavel Eljanov. From the black side of the board, Carlsen came up with an unusual Queen Bishop Fianchetto opening in order to counter his co-leader’s non-committal 1. Nf3. As the middle game commenced, the world champion was able to generate play on both the king and the queen side. On move 22, Eljanov declined trading his bishop for Carlsen’s knight and cost himself a pawn. On the very next move, queens were traded off and Carlsen was simply enjoying a better position, having placed his knights on dominating posts. By the 29th move, Eljanov was about to lose a second pawn. 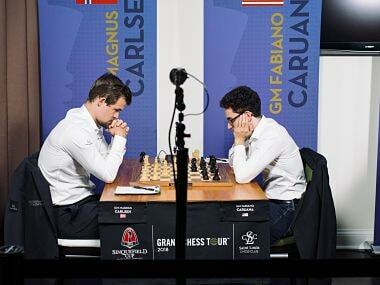 With hardly any play for his pieces, Eljanov shook Carlsen’s hand in resignation. Perhaps, his resignation was a bit premature. 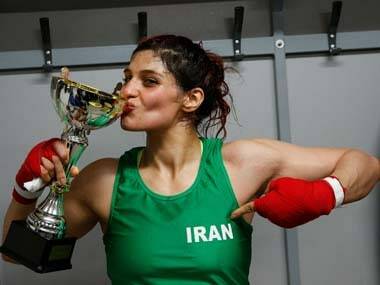 But at the same time, there hardly was any hope for him given the passivity of his position and the fact that he was playing the world champion. With their wins, Gujrathi and Anand have catapulted themselves into the sole second and joint third spots respectively. 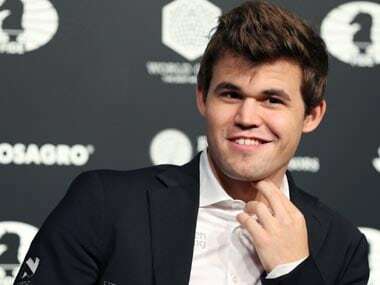 In round seven, Gujrathi will be playing on the top board against the tournament leader and world champion Magnus Carlsen. This is the first time the two are going to meet over the board in a classical game. However, Gujrathi had played a rapid game against Carlsen back in December last year and had lost. Nevertheless, this will be a huge learning opportunity for the bright Indian talent. Anand will be playing on board three against Alexander Lendermann and is definitely the favourite in this matchup. However, Lendermann has had a dream tournament in Douglas and will be a tough nut for Anand to crack; especially since Anand will have the black pieces.